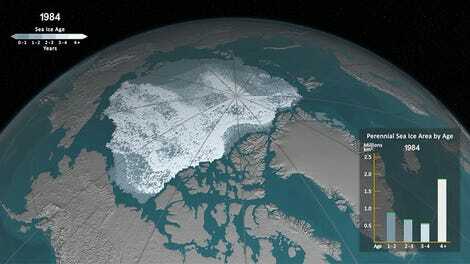 The Greenland ice sheet contains enough water to raise global sea levels 24 feet should it all melt. And a massive melt-out is exactly what seems to have happened about a million years ago, according to a groundbreaking analysis of a unique geologic sample from Greenland’s rocky underbelly. 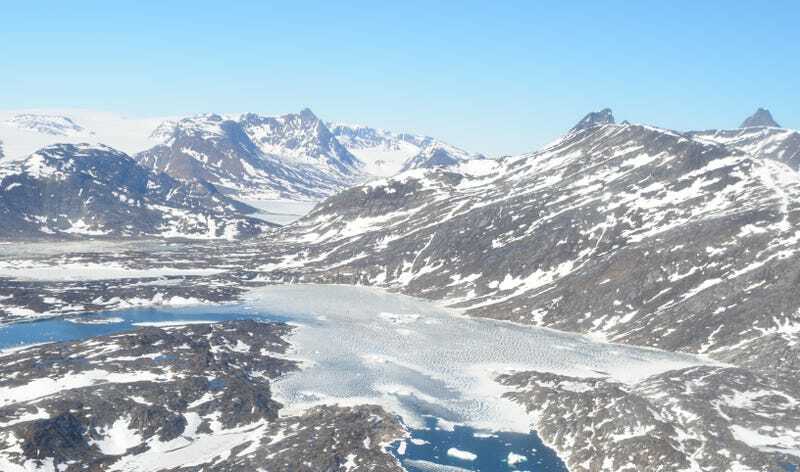 Well over half of the Greenland ice sheet appears to have melted to bedrock in the not-too-distant past, when temperatures weren’t much warmer than they are today, according to new research led by paleoclimatologist Joerg Schaefer of Columbia University’s Lamont Observatory. Schaefer’s analysis, which is published today in the journal Nature, casts doubt on long-held assumptions about the stability of Greenland’s 684,000 cubic mile mantle of ice, suggesting there are unknown mechanisms that can trigger rapid melting. Naturally, this has scientists more concerned than ever about future sea level rise, as our planet continues to warm and Greenland sheds ice at an ever-increasing clip. This story begins in the late 1980s, when two teams of geologists, one American and one European, embarked on unprecedented drilling expeditions to acquire ice cores representing the entire length of the Greenland ice sheet from its thickest section, a site in central Greenland where the ice is piled up about 10,000 feet (3,000 meters). It took each team five summers to drill through the ice, but the prize was a series of cores that have allowed Earth scientists to reconstruct a world-class record of Arctic climate history. The European team, concerned about breaking its sensitive drilling equipment, stopped when it approached bedrock. The American team did not let such concerns get in the way of its desire to keep drilling, and instead, on July 1st 1993, they “decided to slam their drill crown down,” as Schaefer put it. The Americans ended up punching through 5 feet (1.55 meters) of solid bedrock, collecting geologic samples of a surface that, today, is entirely buried by ice. The GISP2 bedrock samples, as they’re called, have been sitting in storage for nearly a quarter century. Only very recently, with the advent of high-resolution accelerator mass spectrometers, have scientists been able to probe these rocks for trace quantities of atoms that can tell us about the land surface’s history. That’s exactly what Schaefer and his colleagues have now done. In their new study, the researchers analyzed samples of the GISP2 bedrock to determine the abundance of two of the rarest isotopes on Earth, beryllium-10 and aluminum-26. These “cosmogenic nuclides” rain down on Earth from outer space, dusting the upper few meters of surfaces that are exposed to the air. Since beryllium-10 and aluminum-26 each have a known decay rate, scientists can use them to figure out how long it’s been since a surface was last exposed. The cosmogenic nuclides in the GISP2 bedrock tell us something astonishing. This region of Greenland, which remember, is today covered in 10,000 feet of ice, was exposed and ice-free as recently as 1.1 million years ago, for at least one chunk of time, and perhaps many, spanning 280,000 years over the Quaternary (the last 2.6 million years of Earth history). It’s worth noting that the analysis is based on a single sample of rock. But that sample was taken from underneath the thickest part of the Greenland ice sheet, and most models agree that this would have been one of the last places to melt out were the ice sheet to retreat. The implication, therefore, is that most of Greenland was ice-free when beryllium-10 was raining down on GISP2. “I would say that the leading hypothesis [now] is that not too much warming is required to remove much or most of Greenland’s ice to expose rock at GISP2,” study co-author Richard Alley told Gizmodo in an email. Alley added, however, that scientists don’t think Greenland melted completely in recent history. Indeed, another cosmogenic nuclide analysis, also published today in Nature, highlights the long-term stability of ice from East Greenland. That analysis, which was led by the University of Vermon’s Paul Bierman, found very low levels of beryllium-10 and aluminum-26 in marine sediment cores off the eastern coast of Greenland. Bierman and his colleagues interpret this to mean that the sediment source—Greenland’s eastern highlands—has been ice-covered for the past 7.5 million years. Patches of Greenland’s ice may be quite stable. Nevertheless, the conclusion of the Schaefer’s study, that the majority of the ice sheet melted rapidly in recent history, is certainly cause for concern. Indeed, the interglacial periods encompassed in the GISP2 bedrock featured atmospheric CO2 levels of around 280 parts per million (ppm), similar to CO2 levels in pre-industrial history. In the span of a few centuries, human activity has pushed the CO2 concentrations north of 400 ppm, with more carbon added daily a rate unprecedented since the dinosaurs went extinct. If Greenland’s ice sheet was sensitive before our global atmospheric experiment got underway, it’s likely to be even more so now. Correction: Because of a copyediting error an earlier version of this post quoted Schaefer as saying moon rock samples were retrieved in the 1990s, when he in fact (correctly) said they were retrieved in the 1970s. The text has been corrected.